Our emails offer you a great way to stay in the loop. If you think oh no not another one think again. Some people, like me, get thousands of emails in a week’s time, but it only takes me a minute a day to respond to the ones that I really want to use. Remember too that email makes it easy to search for the coupon that you want just when you need it so no more printing and clipping coupons is needed here. If you are like me you love shopping and I like discounts. Discounts on any website or store are a positive thing. Don’t fear emails embrace them! We are different in every way! We are not just sending you another coupon, but each month you’ll get the first opportunity to read our Blog Spot. These blogs compile knowledge from the president and CEO of Spot laundromats to bring you the knowledge that you can’t get just anywhere. If you still aren’t sure about another message in your inbox think about this, we have exclusive contests that will give you a chance to win FREE laundry services, and Spot exclusive products. Enjoy coupons, and news about upcoming Spot promotions, events and charity opportunities. You are important to us, and we don’t want this to be a one-sided email so every email will give you a place to reply back and tell us your thoughts, ideas, and opinions. You make up our company without you we wouldn’t be here. 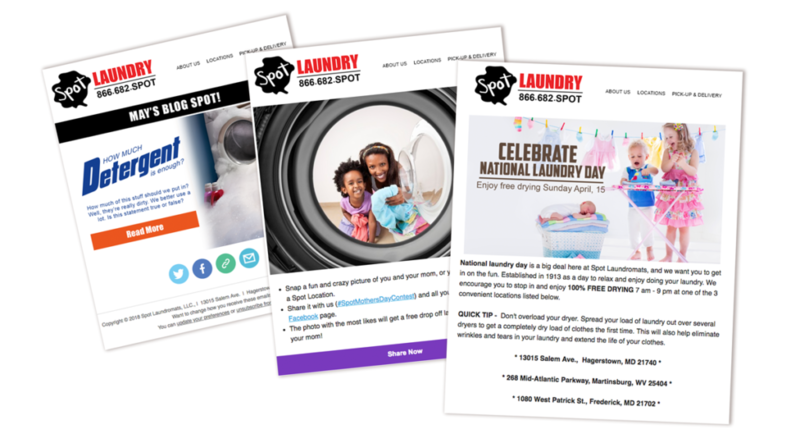 So here at Spot, we are all about YOU, and we love laundry too so join our email list today, and become a true Spot loyal fan! Want another way to stay in touch? Check out our Spot Facebook page. It’s packed full of stuff that you won’t see anywhere else, and we guarantee you a fun time too!